Since getting a dog two years ago I’ve upped one of my favorite things to do, which is to go for a walk. A walk is considerably different from running, something I also like to do, because of the relaxed pace. When I run I’m focused on getting exercise, paying attention to my breathing and footsteps. Walking makes it easier to notice things outside of myself. I can more easily turn my head to see something and to stop to take it more fully in. So it was when walking in Seattle with my dog, Bentsen, that I started noticing the number of “Little Free Libraries” that exist in our neighborhood there. 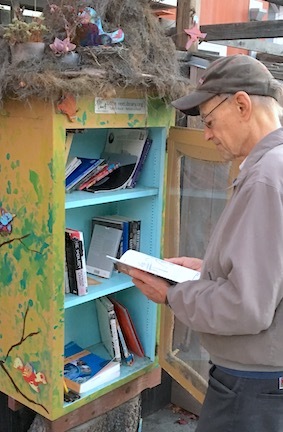 If you’re not familiar with the concept, a Little Free Library is a small structure that someone builds and puts on their property for the purpose of freely sharing books. It turns out it’s a pretty big deal, even set up as a federally recognized nonprofit with many of these little structures of free books being registered and linked to a world map. For me, this is another example of the ordinary kindnesses that are happening all around us all the time. Stop and think about it for a second, even imagine the effort involved. Someone is inspired to share some of their books with others. They take the time to build and mount a decorative box to hold their books. Then they put the box in an easy-to-access spot on their property with some kind of sign that encourages people to take a book. Many of these folks even take the time to register their little libraries online. That’s a lot of effort to do something nice, effort that I think fuels the project itself. Similarly, now imagine a walker who comes upon the little library. For me, the first time I saw one I was stopped in my tracks. Here was a little structure with books inside encouraging me to take one. Frankly, it made my day. And since seeing the first one, I’ve conditioned myself to look for more. They always bring me joy and get my imagination flowing. Why these books? Who put them there? When I see children’s books I imagine that kids are involved. Since seeing my first, I’ve discovered a wide variety of little libraries, including some that encourage people to leave little notes for each other. In my life, I have the luxury of getting to travel. 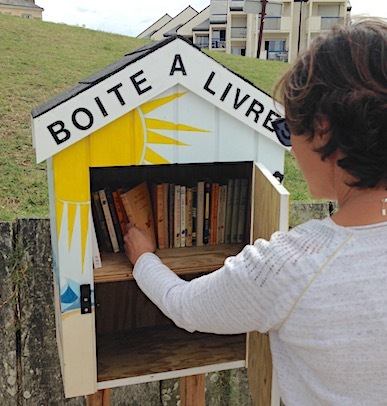 And in the last two years I’ve seen little libraries in a small city in France and in Amsterdam. 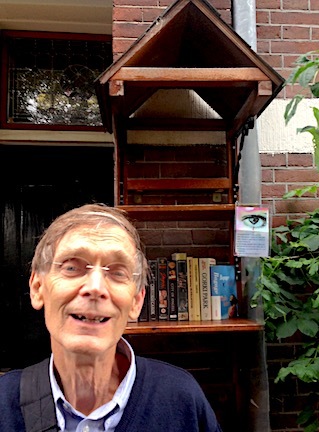 In Amsterdam, I came upon one while someone was examining the books in it. I struck up a conversation with him and he told me about the variety of books he has found in it since it was constructed. He also told me about another little library a few blocks away that I, of course, went to visit. A couple of months ago I moved to Berkeley, along with my wife, Melinda, and Bentsen. And this week I was out walking and came upon a little library a couple of blocks from our apartment. A man was looking at the books inside. Initially, I walked by, not wanting to disturb him, but than I walked back and asked if I could take his picture. He readily obliged and we had a very pleasant exchange for a few minutes. He gave me his business card and I shared the web address of my blog. So I’ve had two experiences now, one in Amsterdam and one in Berkeley, in which I’ve not only derived joy from the existence of these little libraries but had a very pleasant unplanned human interaction because of them. Spend time in your neighborhood looking for the good things taking place. Finding one, consider it in some depth. What had to happen to help this good thing come into existence? Feel free to make up a scenario if you need to (an imagined activity can have as much impact as a real one). For bonus points, tell someone else about your experience.